Peaches are delicious in season. Here is a pie that can be made ahead of time. Although fresh is best, using a good quality peach tin/can is perfect if you are short on time. The sherry custard cream is divine. Mix in a food processor the flour sugar and salt. Add the butter; chilled and in small pieces, using the pulse button, make it into liitle crumbles like a coarse meal. Add to this the egg yolk and water and once again using the pulse button, until the dough comes together in one clump. Remove from the bowl and bring it together on a piece of cling film, shaping it like a disc. Leave it to rest in a cool place. Roll it out as a disc and place it in a 9 inch deep pie dish. Using the remaining dough for decoration. In a preheated oven of 400F/205C bake the pastry for 15 minutes. Bake the decoration pieces seperataley on a tray. In a pan mix the sugar flour salt and cream. Whisk to cook over a low flame. Bring to a boil for a minute or two. In another bowl mix 2 egg yolks vanilla and sherry, mix it well. Now add 1 tbsp of the hot mixture to the egg and beat it well. This will temper the eggs so they don't curdle. Now through a sieve push the egg mix into the cream mix and keep mixing. Bring it back to the stove for a minute to allow the eggs to cook through. Keep stirring to keep it smooth. Put a piece of cling film over the custard so it does not form a skin over it. 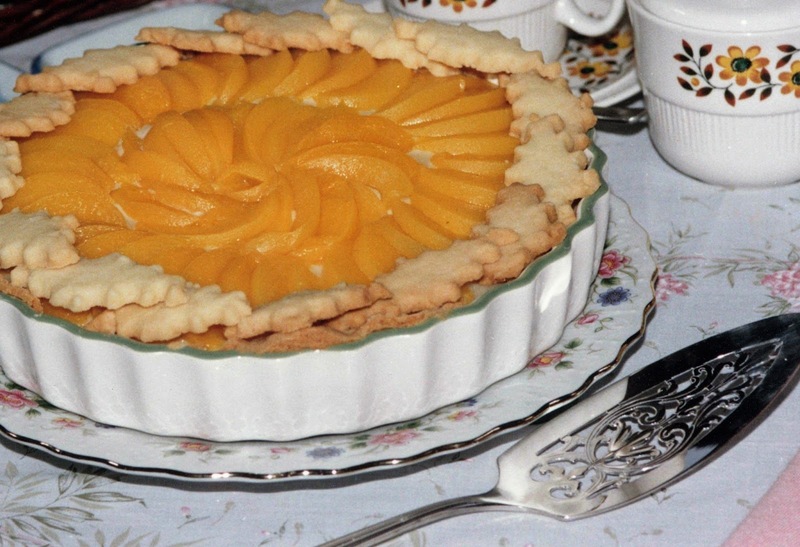 Once the pastry has been cooled and the custard has been cooked and cooled, fill the pie with the pastry cream. Refrigerate. Prepare 3 peaches blanched, peeled and sliced or drain a can/tin of cling sliced peaches and use the slices to decorate. If using fresh peaches or nectarines, blanching the peaches makes it easy to peel and slice. Immediately squeeze fresh lemon juice to avoid the fresh peaches from browning. While perfectly ripe peaches or nectarines are best, check for firm fruit for best results. White peaches and white nectarines tend to be sweeter then the yellow ones. i was tired of repeating the same old cake every sunday for family dinner. finally my aunt wont be complaining about bland cake. your recipe seems like a summery treat i should try. thank you so much! This is the best dessert recipe i have seen so far. I love peach and i also use it's syrp in many desserts as flavor. Thank you for taking the time to share your happy thought.